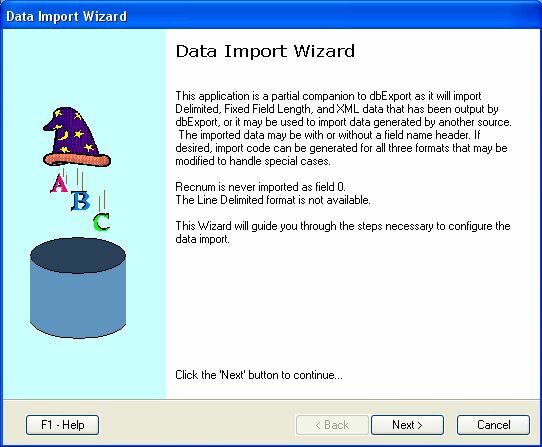 DbImport is a new VDF wizard that will import data of multiple formats into DataFlex data files, or SQL if that's what you use. 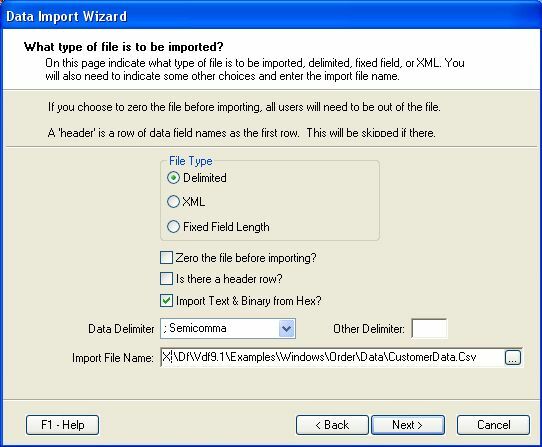 In addition, it will generate code for these formats that you can use for custom importing. The Delimited format will read data with strings enclosed in quotes or not, but separated by the desired delimiter. The delimiter may be selected from a combolist or entered by the user. This format is compatible with output from dbExport. Cdata sections may be read or not. This format is also compatible with output from dbExport. In the case of fixed field length files, dbExport exports data in a format that is NOT compatible with dbImport, as dbExport adds a single blank column between data elements if the field width is longer than the length of the field name. If the data field width is less than the length of the field name, then the field name length is used instead, plus the blank column is included. 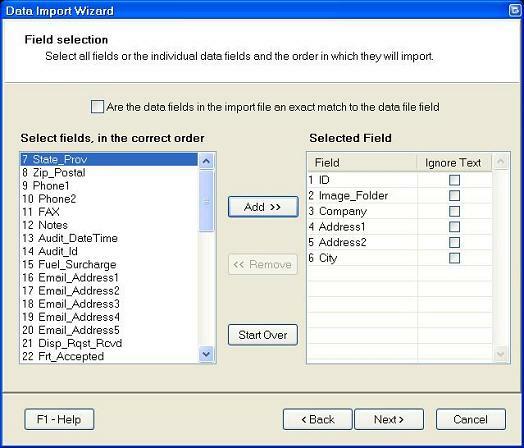 An entire record - all fields - may be read, or individual data fields may be selected, in any order. Header records in delimited and fixed field formats can be in the import file, but will be ignored. Text and binary fields may be imported in HEX or ASCII. Generated sourcecode is IDE compatible and can be added to Abdata by the wizard. All of the above apply to both the direct internal import and the generated code. August, 2004 - Fixed a bug where if input file had fewer number of columns than the data file, the last input data field would be written to all remaining data file fields. November 2007, this dbImport version was originally released for VDF12.0, but it will work fine in VDF12.1 too. The package depends on the vWin32fh package to be included in a current workspace path or library.